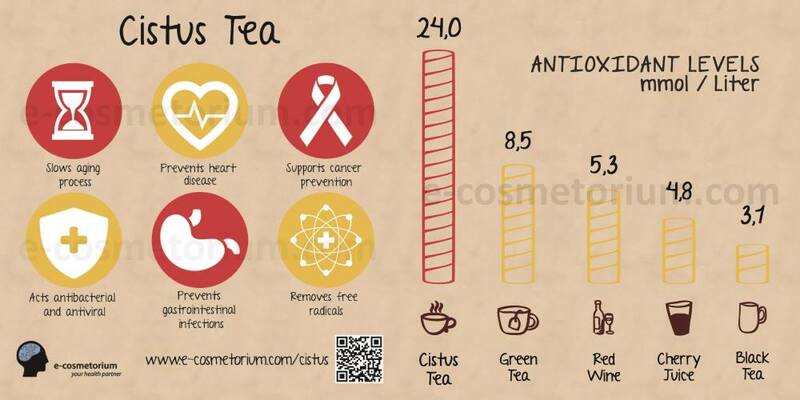 Cleansing herbal tea – Cistus incanus is the richest sources of polyphenols-phenolic compounds belonging to the group of plant substances with antioxidant activity supporting the human immune system. Cistus Incanus offers a rich source of polyphenols, proanthocyandidins, bioflavonoids, catechins, gallic acid, rutin and other beneficial bioactive compounds. Flushes toxins and heavy metals, slowing down the aging process. It has a great ability to capture and remove free radicals. It can bring relief to men of older age who suffer from enlarged prostate, since it has antiproliferative and cytotoxic properties. Strengthens the immune system, acts as firewall against diseases. It’s a strong antioxidant plant that has a great ability to catch free radicals. As a result, it has a rejuvenating, anti-inflammatory and vitalizing effect on human body. Cistus Incanus can also be used for pets in order to protect them against fleas and ticks. Drinking the extract from Cistus Incanus Health Embassy regularly causes a change in the smell of body discharge. In case of a problem with, e.g. an unpleasant smell of sweat (armpits, feet), after a few weeks of drinking tea made of cistus, it will be noticeable that the unpleasant smell has greatly reduced. Apart from deodorant with magnesium, it is the second thing really worth considering. In a cup add 1-2 teaspoons, pour boiling water, brew covered for about 8-10 minutes, strain it and drink it regularly throughout the day. You can brew it twice.